Some three reel slots offer a little more than the standard classics and that’s the case with this intricate-looking game from Betsoft. Random Runner is a case of two games in one with a few added extras and it’s fair to say that it takes a little bit of getting used to so read the rest of our review to find out how to make the most of this game. 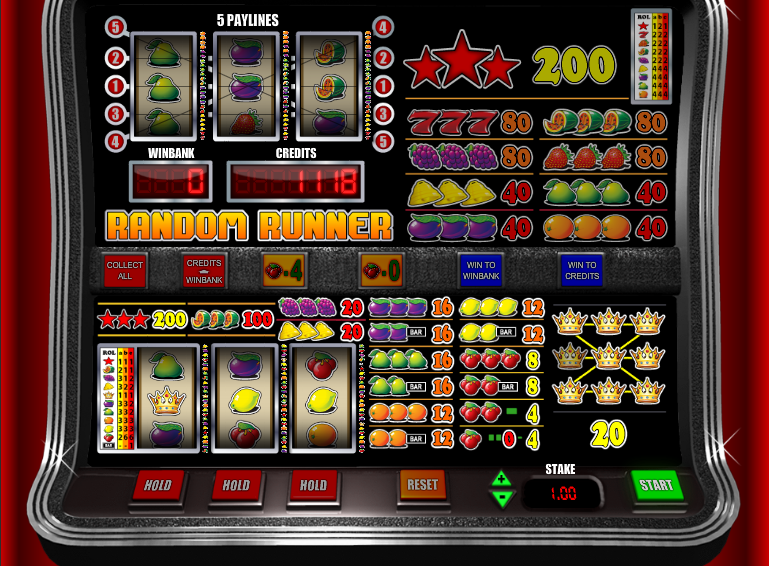 Random Runner’s base game involves three reels and one payline and this is the traditional part of this slot. The symbols are a range of traditional icons including cherries, lemons, oranges, pears, plums, bells, grapes and melons. Stars are the most valuable with three on the payline worth 200x your stake. The crown is a scatter symbol, three of which anywhere on the reels will win you 20x your stake. The smallest win in the base game is 4x your line stake and any win will give you the opportunity to move your gameplay to the top game. After a win you will get the opportunity to transfer those funds to the ‘Winbank’ by pressing the ‘Win To Winbank’ button. You will see those winnings appear in the box under the top game and you can now play on these reels at a cost of 4 per spin. These reels have five paylines and the prizes are higher. Additionally, some symbols have small stars attached which will win you 200x your wager for three on a payline. At any point you can transfer the Winbank funds back to credits and go back to the base game. If you land a single cherry on the first reel in the base game the machine will auto-gamble for you – you might win four credits of you might end up with nothing. Holds are available in the base game and when offered can be used to freeze single reels in the hope of landing a win on the next spin. This is quite useful when one or two crowns appear and you want to hold those reels in hope of a third appearing. The machine will hold likely wins for you automatically. This is a really engaging slot which should appeal to those who like the bonus features as well as those who prefer classic games. Betsfot have done a good job of replicating a physical machine but it might be worth turning the ‘realistic’ sounds off pretty quickly.